I like the humidor-nice size and can hold my small stash of cigars. The gauge/hygrometer was not installed; I anticipated that it was installed. I ordered one with a digital hygrometer instead. This is a great start up humidor. This modern looking polished walnut humidor would fit in superbly in any setting. There is an included humidifier and hygrometer to help maintain ideal conditions within your humidor. Easily maintain your humidifier with distilled water to keep it working properly. Make sure to get this as a gift for the cigar lover in your life today. I bought this for my husband and it looks good in his man cave and works like a charm. 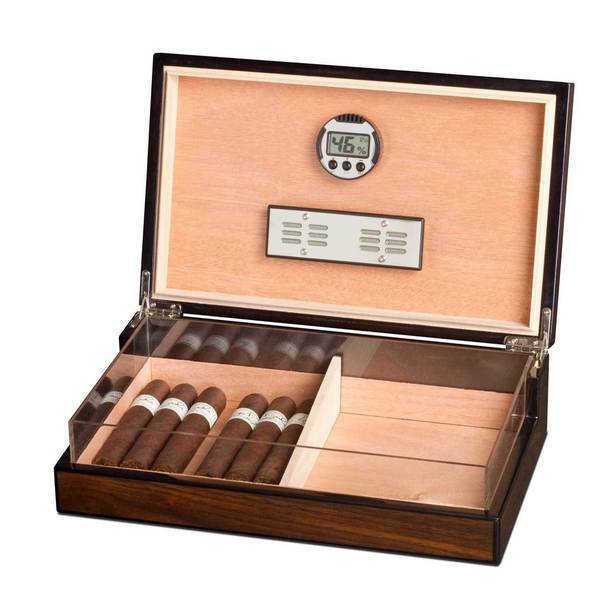 It holds a modest amount of cigars, perfect for the casual smoker.